Indiana Area boys placed three in the top four led by league champion Adam Lenze (17:35) to earn the county championship over Balirsville 46-61. For the girls, Hannah Fulton of Marion Center cruised to the league championship with a 42 second victory with a time of 20:40.5 and her performance led five in the top twelve overall to win the league title by one point over Indiana Area 29-30. Mars Area narrowly escaped a comeback bid from Moon Area for the team title, with Mars 5th runner finishing 13 places behind Moon Area's number 5. In the end, three runners in the top twenty was enough for Mars Area to win the league title 96-98 over Moon. Individual championship honors went to Marshall Bruce of Beaver Area, who ran 16:56 to win by a single second over Jake Deweese of Freedom Area. For the girls, Moon Area had a comfortable race to the league title, placing three in the top ten led by a 5th place finish from Madison Marince to defeat Quaker Valley 50-88. 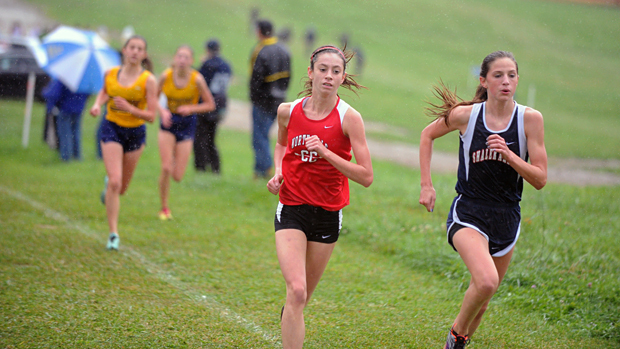 Alexis O'Shea of West Allegheny ran 19:50 to become the league champion by 5 seconds. 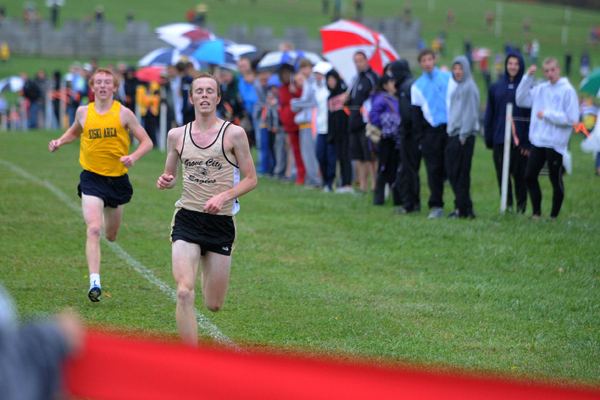 Brent Kennedy of Kiski Area became the county champion with a winning time of 17:08 to win by 20 seconds over Jon Faye of Hempfield. Kennedy's performance also led his team to a team title win over Franklin Regional 39-69. 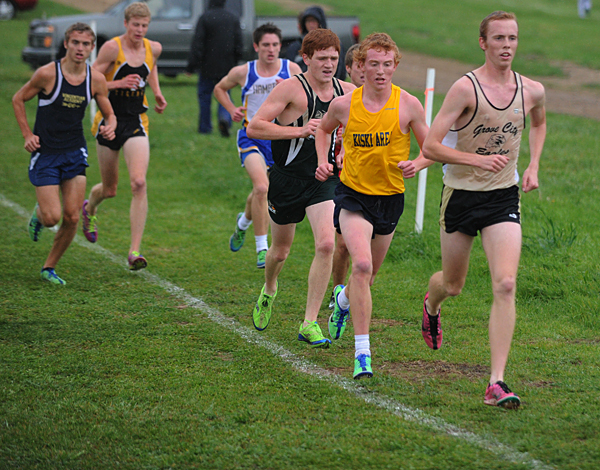 Behind Kennedy, Kiski Area also had three other finishers in the top ten overall. For the girls, Kiski Area completed the team title sweep, placing five inside the top eighteen led by a 5th place finish from Lauren Smeltzer to defeat Hempfield 54-62. Hanna Green of Latrobe ran 20:05.7 to win the county championship by 16 seconds over Kaitlyn Figurelli of Franklin Regional. 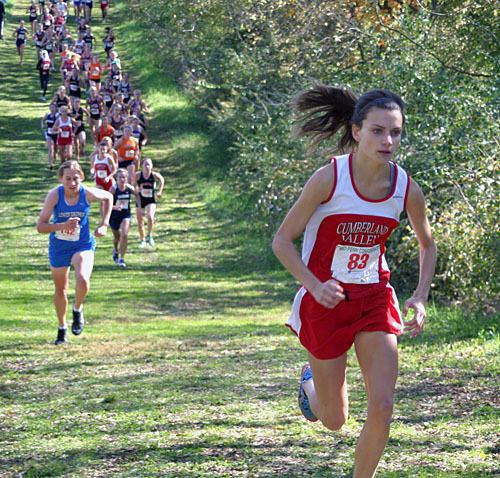 Mady Clahane of Cumberland Valley continued her phenomenal 2012 freshman season with a league championship title. 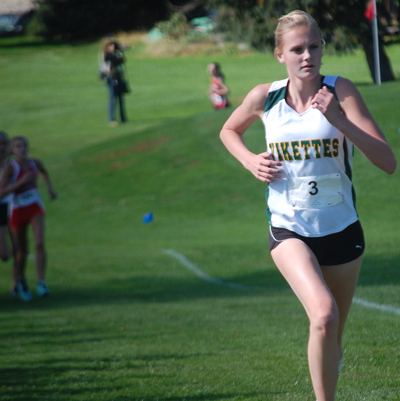 Her performance of 18:48 was over one minute better than teammate Carol Strock. Their 1-2 finish was not enough to secure the team championship, as PA's number 2 AA team Palmyra placed three in the top ten led by a 5th place finish by Maria Tukis to win the title 70-87. For the boys, Vinny Todaro of Big Spring held off Liam Corcoran of James Buchanan by two full seconds to win the league championship with a time of 16:11. Nate Hamilton of Hershey finished 3rd, three seconds behind the winner. Hamilton's performance was good enough to lead his team to the league title over Lower Dauphin 96-128 with four in the top 25 overall. Malvern Prep boys retained their league championship, narrowly defeating Penn Charter and Germantown Academy 42-48-50. Ben and Sam Ritz went 1-2 for Germantown Academy, with Ben running 16:21.7 with Sam a second a half behind him. They also had a 4th place finish from Huang-Hobbs Max to keep them in the title hunt. Penn Charter had the best 1-5 spread in the meet of 1:11 seconds, which was 10 seconds better than Malvern. But Malvern scored places 3-5-10-11-13 led by the 3rd place finish from Jaxson Hoey to hold on to the crown. For the girls, Springside came away with the team championship over Germantown Academy and Penn Charter 54-61-73. Jamie Costarino of Springside won the league title with a time of 19:20 to win by 8 seconds over Catie Skinner of Penn Charter. Springside were the only team in the field to place three inside of the top ten. Kirsten McMichael (sophomore) from Ringgold won her 2nd consecutive Washington County Coaches Cross Country Invitational title with a time of 19:48, 20 seconds ahead of Danielle Frank from Trinity (Washington). McMichael also won as a freshman last year. Canon-McMillan won the girls' AAA team title with just 45 points behind the 4th place 20:55 by Madison Grudi. Canon-Mac placed five in the top 18. Ringgold placed four girls in the top 20, giving them "All County" honors. Including McMichael with the "All County Title". Also scoring for Ringgold were Janika Hutton (12th), Angie Brennfleck (14th), and Amber Mathews (20th). McGuffy won the AA girls' title. Mara Mcbride was their top finisher, taking 15th overall in 21:49. The boys champion was Marco Bennett from Burgettstown in a time of 16:43, 10 seconds ahead of D'Heaven Kelley from Washington. Canon-McMillan captured team honors by 20 points over Burgettstown, 35-55. Ethan Lindemann was the top Canon-Mac running, taking 4th in 17:06. Ringgold placed Noah Smith(17:20) 6th overall to get "All County" honors. Mount St Joseph's girls came away with the league championship over Gwynedd-Mercy 30-76, led by a 1-2 finish from league champion Meredith Reiche (18:25.7) and silver medalist Haasiyna Taylor (18:34.1). Gwynedd-Mercy were led by a 3rd place finish from Emma Keenan (18:51.6) with Paul Short White race champion Veronica Wheeler of Nazareth Academy finishing 4th and Megan McGarrity of St Basil Academy rounding out the top five. Veritas Academy boys took the first four overall places led by a championship winning performance from Seth Spykstra (17:22) to take home the team title. Kara Martin of Veritas Academy won the girls race with a time of 22:44 to win by nearly a minute. Sami Aziz of Germantown Friends ran 15:52.1 to win the league championship by over a minute over teammate Lyle Wistar and his performance set a new George School course record. Germantown Friends placed five in the top six overall to score 17 points and cruise to the league title. For the girls, Germantown Friends placed five in the top eight led by a league championship performance from Eliza Lukens-Day (19:24.1) to score 24 points and win the team title. Penn Manor boys used a 2-3 finish from Harrison Schettler (16:36) and Jonathan Bitner (16:47) and a 1-5 spread of 56 seconds to win the league title over Hempfield 69-100. Shawn Wolfe of Annville-Cleona came away with the individual league title with a winning time of 16:22. Hempfield girls had a little bit more luck than their male counterparts, as they came away with the girls championship over Garden Spot 96-103, with Hempfield being the only team with three inside the top 20. Greta Lindsley of Penn Manor cruised to the individual title, running 18:30 to win by 75 seconds over Emily McBride of Manheim Township. 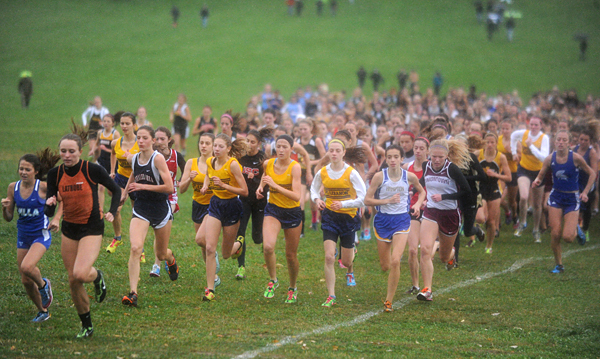 There were plenty of unknowns going into the LVC Girl’s event. The competition appeared to be wide open as the front runners often swapped positions in their meetings throughout the regular season. Add to that a lot of inexperienced top runners and you had a barnburner of an event. When the dust settled it was freshman sensation Colleen Daday of Central Catholic who handled the pressure and took home the top honors in a time of 19:30 at Bethlehem Municipal Golf Course. The youngster took control of the race early and cruised to a 23 second victory over fellow freshman Mikayla Stoudt of Parkland (19:53). Yet another freshman, Easton’s Diana Hammerstone, cracked the Top 5 (5th place, 20:03). The entire Top 5 was in fact all underclassmen, with Parkland’s Cara Moyer and Emmaus’ Hanna Brosky taking 3rd and 4th respectively. If you go all the way back to 11th place, you’d find another freshman in Dieruff’s Willow Childs. The trio of freshmen made the all league team as well. One of the prerace favorites, Freedom sophomore Shaina Palmer, went out with the lead pack, but faded to a disappointing 15th place finish. As expected on the team side of things, Parkland ran away with the title over Emmaus (34-89). 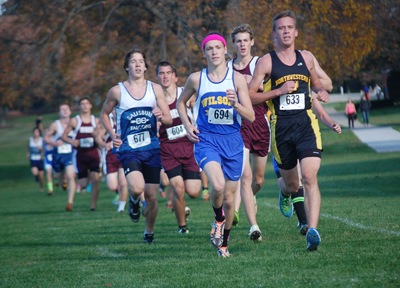 The Trojans’ top 5 runners were 2nd, 3rd, 7th, 8th and 14th. It was the second straight crown for Parkland. The action on the boys’ race was a more clear cut. Sophomore stud Colin Abert of Easton was undefeated in the regular season and a big favorite. Although he didn’t start as well as he wanted, Colin finished with a comfortable 22 second victory over Northampton senior Alec Lederer (16:35 to 16:57). Another senior, Trevor Bergen of Parkland, was edged by Lederer in the final 400 meters and took home 3rd place (16:58). Freedom stole the team Title away from Parkland with a strong trio of underclassmen leading the way in a 34-51 victory. Freshman Dan Quigley was 4th for the Patriots, followed by Junior Chris Kelly in 5th and Sophomore Ben Ziegler was 6th. It was Freedom’s first cross country title since the 1976 East Penn Conference season. Bellefonte boys scored 25 points with five in the top eight to win the team title over Tyrone. Bellefonte were led by a gold medal performance from Mitchell Smith, who ran 16:45 to win by 21 seconds over Michael Decker of Penns Valley. For the girls, Clearfield accounted for half of the top six finishers to earn the team championship over Penns Valley 41-73. Jordan Wiser of Tyrone ran 20:23 to win the gold medal by 19 seconds over Alyssa Limbaugh of Penns Valley. Matt Koch of Stroudsburg earned a 14 second league championship victory over Alex Larkin of Pleasant Valley with a time of 17:21.5 and his performance led five in the top 13 to win the team championship over Pleasant Valley 34-52. For the girls, Stroudsburg edged out Pleasant Valley 24-32 to win the team title with five in the top 11 overall. Rachel Davalos of Pocono Mountain East ran 20:31.2 to win by 1 second over Kristen Eberhardt of Pleasant Valley. Kelsey Ibarra of Central York cruised to the individual title with a time of 19:04 to win by nearly 40 seconds to continue her strong 2012 season. York Suburban were led by freshman Olivia Gettle's 2nd place finish to win the team championship with a score of 47 points. For the boys, Patrick Reilly of Dallastown edged out Ryan Hertzog of South Western by one second with a time of 16:19 to win the individual championship. Red Lion came away with the team championship with a score of 71 points with four in the top twenty overall. Governor Mifflin swept both team titles in confortable fashion to get their championship seasons started in the right direction. The boys had a 1-5 spread of 48 seconds led by league champion Evan Williams (16:37) and five in the top eleven to score 31 points to defeat wilson by 42. The girls placed three in the top five overall led by a 1-2 finish from league champion Tessa Mundell (18:47) and runner up Hannah Mansell (19:16). Their team score of 39 points was 30 points better than Daniel Boone. The Colonial League action was held at DeSales University on Wednesday. Saucon Valley junior Elizabeth Chikotas tied a league record by winning her 3rd straight crown in a time of 19:26. While you can’t exactly call her young at this point, she is still an underclassman. Two more experienced juniors follow behind her in Bangor’s Meredith Colton (19:37) and Northwestern’s Haley Yost (20:04). They swapped positions from last year’s meet. 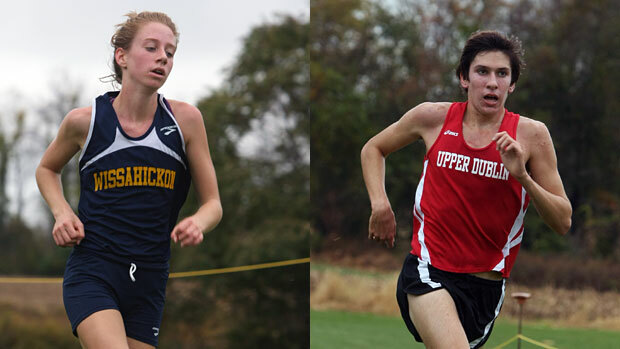 Rounding out the top 5 were Southern Lehigh’s senior Shelby White and Northwestern’s sophomore Rachele Cerrone. Regular season champion Northwestern easily won the team race 43-83 over Notre Dame Green Pond. The Tigers top 5 runners were 3rd, 5th, 7th, 12th and 15th. Northwestern has won back to back league titles and 3 out of the last 4. In the Colonial boys’ race, Jaryd Flank of Wilson was the lone senior to win in either conference with a time of 16:59. This race had a lot more experience at the front. The lone underclassman in the top 5 was Salisbury sophomore Kyle Gonoude in 2nd place at 17:09. Catasaqua’s Anthony Brinkley was 3rd (17:22) and defending champion Tyler Stelmack of Northwestern faded from 2nd to 4th place (17:34). Southern Lehigh’s Ryan McGinty took home 5th (17:39). In the team race, things were closer than expected as undefeated Bangor edged Northwestern 50-59. The Slaters top runner, Wade White was under the weather and finished 10th. His teammates were still solid though, as they took home 6th, 7th, 11th and 16th for the victory. It was the second straight Colonial League crown for Bangor. Regan Rome of Dallas ran the fastest 5000 meter cross country race in PA this season, winning her league championship with a time of 17:42 to win by over 1:20 over Rachel Sowinski of Holy Redeemer. Rome's Dallas squad narrowly kept their undefeated invitational record in tact, winning 43-44 over Holy Redeemer, despite Holy Redeemer having three of the top five finishers overall in the race. For the boys, Dominic Deluca of Dallas ran 16:17 to earn a seven second championship victory over Kieran Sutton of Lake Lehman. Deluca's performance led his team to the league title over Tunkhannock 57-63, despite Tunkhannock having five in before the Dallas number 4 runner. Burgettstown boys were the only team to place three inside the top ten and they would go on to win the team title over Freedom Area 66-102. Freedom Area had a 1-2 finish from Wes Roberts (17:11) and Jake Deweese (17:12). For the girls, Freeport had five inside the top twenty overall, including individual winner Kayla Zboran (20:30) to win the team title over Laurel 42-73. 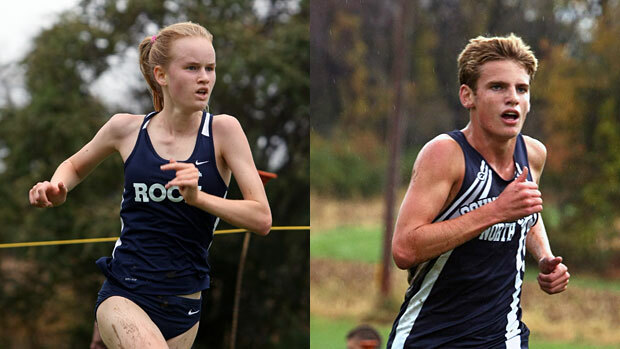 Big individual performances highlighted the Schuylkill League championships. Defending AA boys champion Brendan Shearn recorded the fastest 5000 meter cross country time in PA this season with a winning time of 15:17, almost 90 seconds better than Codi Wood of Pottsville Area. Pottsville did have three in the top seven overall to win the team title over Jim Thorpe 40-53. For the girls, Paige Stoner had an impressive solo performance to win her league title. Her winning time of 18:21 was 2:01 better than 2nd place Abby Warner of North Schuylkill. Pottsville also had four others inside the top eleven and they would win the league title over Blue Mountain 30-50. After a slip up last weekend, Central Cambria girls looked to get back on track before November 3rd's state meet, and they accomplished just that. Alyssa Brandis won the league championship with a time of 19:25 and her performance led five in the top twenty and a team championship with a score of 45 points to Somerset's 70. For the boys, freshman Will Kachman of Bedford came away with the individual gold medal with a time of 16:48, but his team fell two points short of Somerset for the team title 75-77. Bedford had three in front of Somerset's first runner, but Somerset's number five finished 25 points in front of Bedford's number 5 to secure the title. Greg Wagner of Jenkintown ran 15:51 to win the individual championship and keep his team close in the team title race. But placing five in the top twelve overall was enough for Holy Ghost Prep to repeat as overall league champions, defeating Jenkintown 41-62. For the girls, Molly Davies of Lower Moreland earned a ten second victory over Alexa Botelho of New Hope Solebury to become the league champion. New Hope Solebury did place five in the top nine to win the team title over Lower Moreland 25-48. The Fairview boys tallied 33 points, 13 better than rival General McLane to take the team title. 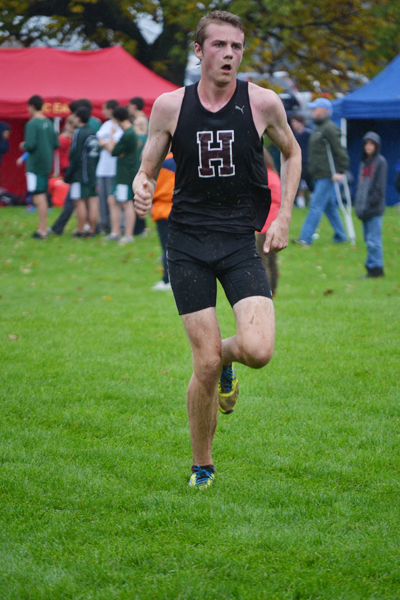 Dan Wilcko captured 2nd for Fairview, who placed five runners in the top 11, and took half the top twelve. Mercyhurst Prep's Sebastian Curtin was the individual champ, running 17:08.1, just edging out Wilko by a half second. Despite a one-two punch from Mercyhurst Prep's Taylor Pletz (19:44) and Sarah Kupniewski (19:55) , General McLane used a 3-5-6-9-13 combo to edge Prep by just three points. Morgan Price was tops for General McLane, taking 3rd in 20:40. Ligonier Valley's boys needed an individual gold medal performance from Josh Patrick (17:22), three in the top nine, and their 5-7 runners beating Blairsville's number five runner to hang on for a narrow team title win 52-55. For the girls, Hannah Fulton ran 20:27 to win the league title over Heather Painter of Homer Center by 17 seconds to lead her team to a comfortable team title win over Ligonier Valley 28-58. Masterman boys repeated as league champions with an impressive performance. Using a 1-5 spread of 34 seconds led by a 4th place finish from Jasper Anderson, Masterman placed five in the top twelve to score 43 points to defeat Central by 61. Science Leadership Academy's Matt Ferry ran 17:54 to win the league title by five seconds over Raheem Henry of Germantown. For the girls, Central took the first four team places led by individual champion Lucy Van Kluenen's 19:58 performance to win the league title over Masterman 22-53. Kara Steinke of Methacton won the individual championship by 1:11 with a winning time of 18:41. Owen J Roberts were the only team who placed three in the top ten to come away with the team title over Boyertown 42-67. For the boys, AA #1 team Pottsgrove were impressive in victory, placing five in the top ten with a 1-5 spread of 28 seconds to win the league championship over Methacton 33-62. Curtis Watro of Methacton ran 16:37 to win the individual title by 14 seconds over Ian Yanusko of Pottsgrove. It's an election year, so one might expect a little history from a convention-like gathering such as the Tri-State Coaches Association meet at Cooper's Lake. 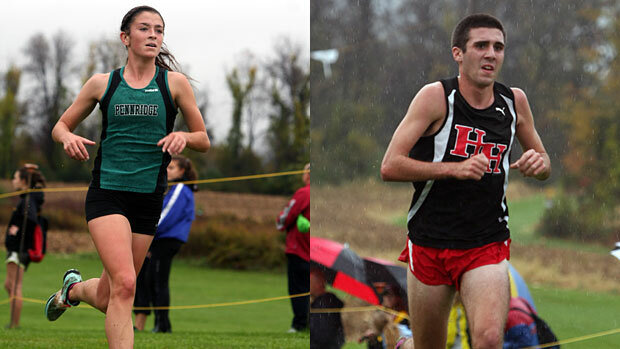 Despite persistent rain showers that turned the course muddy brown by day's end, Grove City's Daniel Jaskowak and Shaler Area's Brianna Schwartz had performances ranking among the invitational's best ever, as did state-ranked North Allegheny and Mt. Lebanon in winning the boys' and girls' team titles, respectively. Jaskowak and Brent Kennedy of Kiski Area had slugged it out earlier this season at the Red, White & Blue Classic, but Thursday's showdown was unquestionably the winner by a landslide. 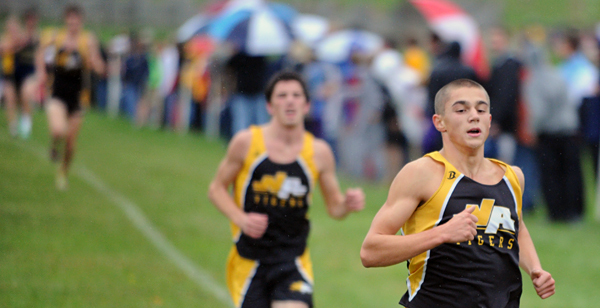 Jaskowak and Kennedy, who was third here last year, were stride for stride heading into the final 250 meters as the 2011 state medalists both looked for their chance to lead last. As the duo reached the castle for the final sprint to the finish, Kennedy moved first with Jaskowak off his right shoulder. 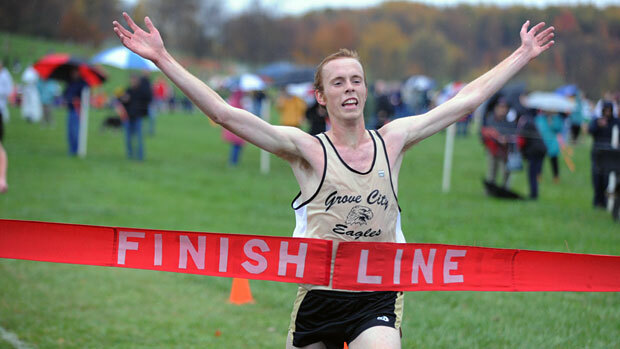 The Grove City senior covered the distance in 15:36, just a second ahead of Kennedy. Taylor Allderdice's Ean DiSilvio was third in 16:01, while Ethan Martin of Fox Chapel was next at 16:06. Jaskowak, Kennedy and DiSilvio had led the field of nearly 600 through the first mile in 5:07 as the front group of nine was whittled down to the top three finishers as the runners pushed through the second mile. With DiSilvio trying to maintain contact, Jaskowak pulled away slightly on the downhill segments before Kennedy responded and closed the gap. “The week before he was concentrating on the kids that were going to be here,” Grove City coach Mike Sample said of his standout. “We're always looking for the competition. 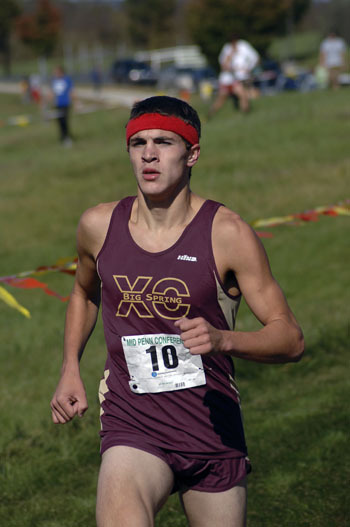 Although his most recent race on the Cooper's Lake course was as a freshman in 2009, Jaskowak showed one doesn't have to know each turn to be able to turn heads with a performance. His winning effort was just off the meet record of 15:30 by McGuffey's Jeff Weiss in 2004. Weiss was a Foot Locker Finalist that year. North Allegheny's boys and Mt. Lebanon's girls have followed similar paths throughout the 2012 season. Both were No. 7 in the preseason state rankings, and both moved up the list with tight pack running and victories in large invitationals. Both also feature rosters loaded with young, talented runners, with John Neff's PA#2 Tigers relying heavily on a core group of sophomores and the PA#3 Mt. Lebanon girls showing three freshmen and three juniors on Thursday's roster. With more than one runner occupying the No. 1 spot during the season, North Allegheny has turned in consistently low spreads for their 1-5 runners. The Tigers went one step better than their 17-second gap when they demolished the field in Pittsburgh. Only 16 ticks elapsed between senior Josh Zemet (16:11) in fifth and junior Cordon Louco (16:27) in 13th as sophomores Matt McGoey (8th, 16:17), Scott Seel (11th, 16:22) and Seamus Love (12th, 16:23) were in between. The end result was a title-winning 49 points for North Allegheny. Runner-up Mt. Lebanon finished with 139 points off a 1-5 spread of 20 seconds as senior Seamus Roddy led the Blue Devils at 16:40 in 19th. Mike Agostinella's squad needed just six more seconds to have all seven runners across the line. Central Catholic was third with 187, while Fox Chapel was fourth with 203. With Ethan Martin in fourth and Colin Martin 10th, the Foxes were the only team to have a pair of runners finish before North Allegheny's fifth crossed the line. “I like to keep it very practical on a day like today, say 'What you do today is going to help you next week (at WPIALs),” the North Allegheny coach said of his pre-race talk with his team. “That's it. You don't want to pickle that big speech until it's time. Mt. Lebanon's girls showed that they have the top runners and depth to factor in the final standings at Hershey. With their No. 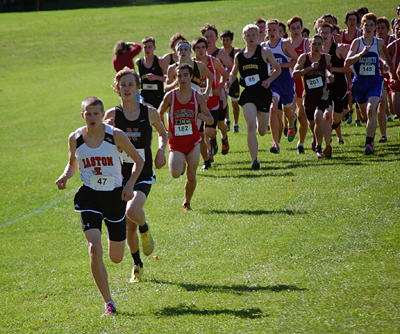 5 runner finishing 23rd overall, the Blue Devils charted 54 points and topped runner-up North Allegheny (135). Junior Jillian Hunsberger and freshman Kelsey Potts paced the Blue Devils in third and fourth, while senior Julie Kocjancic was ninth. Freshman Madeleine Davison was sixth and junior Caroline Bojarski was 10th to lead North Allegheny, while fellow rookie Bernadette Prichard lifted Villa Maria PA#5 Class AA to third with 206 points. A year ago, Shaler Area's Schwartz was a footnote to history, crossing the line fourth as the first finisher not wearing the red and white of North Hills nor named Malone as the sisters went 1-2-3. Any possible repeat win for North Hills or a Malone sister was squashed in the latter stages of the second mile. Mary Malone and Schwartz had broken away from Mt. Lebanon's lead pair of Hunsberger and Potts as the field began to head uphill again before taking a hard left away from the spectators lining the course. When the runners came back for their last pass across the base of the hill, Schwartz was alone in front and lengthening her lead en route to a superb winning effort of 18:10. “I felt really strong going up the hill and took the lead down the hill and pushed it,” she said. Running a limited schedule this season, Schwartz's victory over 527 competitors comes on the heels of wins at Red, White & Blue and the Central Catholic Invitational, both in Pittsburgh's Schenley Park. Mary Malone was the only other competitor under 6-minute pace with an 18:32, while Hunsberger and Potts followed at 18:40 and 18:46, respectively. 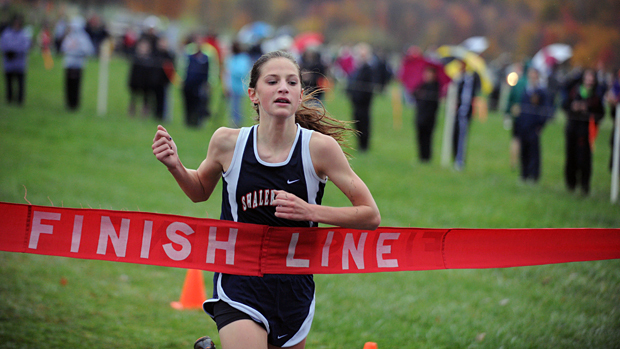 Schwartz's time was not far from the record 17:58 by Greater Latrobe's Natalie Bower in 2008. The rain started at 4:30am and kept on coming until 10 minutes before the first scheduled race at 10:30, leaving the course waterlogged with streams flowing through a section of the course. Through the water and mud, Reiny Barchet (16:39) and Tony Russell (16:42) of West Chester Henderson broke away from a large pack halfway through the race to cruise to a 1-2 individual finish, and their performance led seven in the top 20 on their way to a league championship, edging out a game West Chester East 33-51 with a 53 second spread. Downingtown West finished 3rd with 53 points with a 3-4 finish from Joey Steadman and Kenny Leidal. 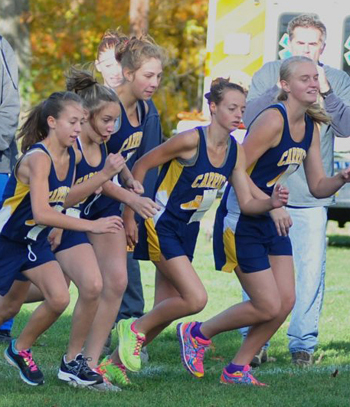 For the girls, Unionville continued to solidify their place as the top team in PA with two weeks to go before states. Courtney Smith was strong once again, holding off Stephanie Aldrich of West Chester Henderson and Ariel Pastore-Sebring to defend her home course and win her 2nd league title in a row with a time of 18:58. Her Unionville teammates were strong too, with the next four placing in the top ten and seven in the top 14 to easily win the title over Downingtown West and Downingtown East 29-94-97. Interboro's Jaylen Williams won the 5k in 17:48. Glen Mills place three in the top seven behind a 4th place finish by Chandler Mattis. In the girls race, Penn Wood's Caela Williams went 21:23 for the victory. Penn Wood placed five in the top nine. A 67 second spread for the Upper Merion boys was enough to earn a 2 point win over individual champion Francis Ferruzzi (16:30) and Upper Dublin, despite Upper Dublin having five in the top fifteen compared to five in the top 18 for Upper Merion. But Upper Merion had three in the top nine and their spread was 23 seconds better than Upper Dublin's. For the girls, freshman Lotte Black of Wissahickon won her first league championship with a time of 20:03 to win by 28 seconds. Her performance led her team to a 2nd place finish, 7 points behind team champions Upper Dublin 42-49 with four in the top ten and a 39 second spread. Central Bucks West and Pennsbury girls both scored 44 points to top the JV standings, with CB West winning with their number 6 runner finishing 3 places ahead of Pennsbury's #6. CB West's 1-5 also had an 8 second spread. Pennsbury did have Jackie Sweeney (20:21), Hannah Papazian (20:52) and Heather Benton (21:02) finish 1-2-3 in the race. For the boys, North Penn cruised to the team title with 47 points to defeat Council Rock North by 53. Will Johnson of Pennsbury earned a 13 second victory with a winning time of 17:24. Central Bucks West girls put on their most impressive performance of the season, placing five in the top ten with a 1-5 spread of 48 seconds to defeat North Penn 30-56 led by a runner up finish from freshman Maddie Villalba. Sophomore Marissa Sheva of Pennridge won her first league title with a time of 18:33 to win by 25 seconds. For the boys, the top four teams were separated by 7 points, but the champion was determined by the team with the best spread. Central Bucks West completed the team title sweep with a one minute spread to score 80 points and defeat rival CB East by 2 points. Pennridge had four in the top 14, but had to settle for 3rd with 85 points and North Penn finished 4th with 87 points. Conner Quinn of Hatboro Horsham had the fastest time of the day, running 15:49 to win by 24 seconds over Jack Macauley of North Penn. Pennsbury gave their conference a glimpse of what life will be like without Sara Sargent. With Sargent not in the lineup, Pennsbury took places two through eight with all seven runners under 20 minutes and with a 1-7 spread of 56 seconds to cruise to the team title over Council Rock North 20-48. Kate Scott of Council Rock North did beat Pennsbury's freshman Maddie Sauer by 5 seconds, running 18:54 to win the individual title. For the boys, Council Rock North stopped the hot streak of Pennsbury in their tracks, placing four in the top nine to win over Pennsbury 28-44. Ross Wilson (15:49) and Mac Emery (15:52) got the best of Connor Harriman of Pennsbury (15:57) and his teammate Sam Webb (16:04) to lead them to the team title. Three girls cracked the 19 minute mark at Rose Tree Park led by individual champion Tess Meehan of Haverford (18:42.2), Alyssa Rudawsky of Garnet Valley (18:53.7) and Ariane Abadi of Radnor (18:54.8). In the team standings, Strath Haven showed their depth with a 58 second 1-5 spread and six runners under 21 minutes to win the team title over Haverford 52-79. For the boys, Max Norris of Harriton comfortably repeated as league champion with a strong time of 15:47.3 to win by 20 seconds. Penncrest placed three in the top eight to boost them to the team title over Haverford 42-81. Saegertown boys showed their depth to pull out a team championship victory over Cochranton and Maplewood 52-67, despite both of those teams having their top three in before their top three. Hunter Johnston of Saegertown did beat the Maplewood 2-3-4 trio of Jeremy and Jake Parsons and Hanz Wentz to win the individual title with a time of 16:19. For the girls, Maplewood overcame a 1-2 finish from individual champion Rielly Walsh (20:04.8) and Olivia Mamula (20:11) with four in the top 11 and their number five runner placing three spots better than Cambridge Springs #5 to win the team title 44-47. Austin Pondel of Corry won the head to head dual with Ryan Smathers of North East with a strong performance of 15:37 to defeat Smathers by 23 seconds. Smathers and his 2nd place finish was good enough to lead his team to a team championship over Union City 43-62 with five in the top 14. For the girls, Kelsey Leasure of Seneca defeated the North East trio of Anne Lewis, Macy Putman, and Alex Artise to win the gold medal in 19:51. North East did win the team championship with those three girls leading the way over Union City 39-79. Cathedral Prep boys had three of the top four finishers led by a 1-2 finish from individual champion Ethan Louis (16:30.4) and John Lacy (16:48.3) earn a narrow team title victory over McDowell 29-35, despite McDowell having four runners finish in front of Cathedral's 4th to make it close. For the girls, McDowell scored 33 points with three of the top five finishers including individual champion Melissa Perseo (20:14.7) to defeat Meadville by 38. Hickory girls cruised to the team championship with five finishing in the top ten, including a 1-2-3 finish from league champion Lexi Bible (19:51), Jackie Abraham (19:57) and Haley Boyd (20:36) to score 25 points and win by almost 50. For the boys, Hickory completed the team sweep with three in the top six led by a runner up finish from Logan Griffen to defeat Commodore Perry 42-74. Nate White of Commodore Perry did run 17:01 to win the gold medal by 20 seconds. 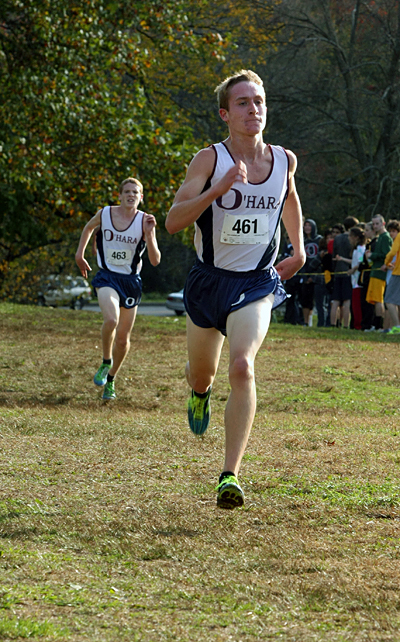 PA#1 Cardinal O'Hara boys continued their dominance of the Catholic League with their 3rd consecutive team championship title, placing six in the top seven with a 1-6 spread of 39 seconds to score 17 points and defeat Lasalle by 31. Dan Savage (15:56), Ernie Pitone (16:00) and Kevin James (16:08) led the way for the champions, with defending league champion Tom Coyle finishing 4th. read of 26 seconds and a 1-6 spread of 33 seconds to escape with a 3 point win over Cardinal O'Hara 35-38. 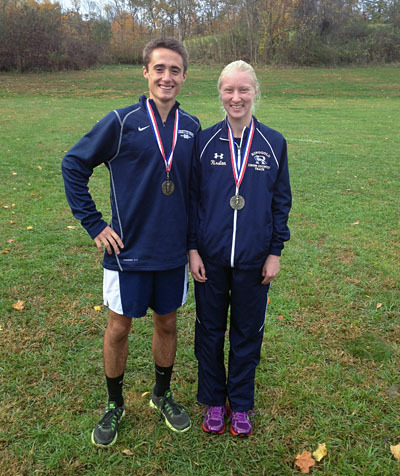 With Taylor Allderdice now competing in District 7 (WPIAL), Carrick has seized the opportunity in cross to sweep the boys and girls team titles at the meet held Saturday, October 20th. With 25 points, the boys bettered Obama Academy by 31 behind an 18:07.2 win by Zach Wierzchowski. Obama's Sam Lapp was second in 18:25.6. Carrick took five of the top ten spots. The girls tallied 26 points behind an individual championship by Ashley Hankins in 22:51. Brashear's Elisa Varlotta was second in 23:00. Carrick placed five in the top eight. Sean Walker of Lewisburg edged out Griffin Molino of South Williamsport by a single second to take home the individual crown. His performance was also good enough to lead his team to the team title over Danville 84-100. For the girls, Danville cruised to the team title with a team score of 31 points to defeat Williamsport by 54. Treicy Cedeno ran 19:23 to defeat the Danville duo of Mackenzie Jones and Emily Haney.